WELCOME TO BARACK OBAMA’S CLASS WARFARE WORLD … Is the Obama tax increase going to force golfer Phil Mickelson to retire, maybe. In an interview with Forbes, PGA golfer Phil Mickelson stated that he may retire and/or move from California as Obama and Democrat tax increases now take more than 62% of his income. 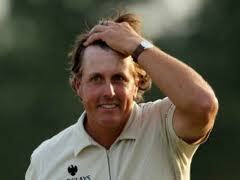 Thanks to Barack Obama, Democrats, Obamacare and the state of California, Mickelson will see far less money at years end. Due to the fiscal cliff bill, Mickelson will experience an increase in his top tax rate on ordinary income from 35% to 39.6%, and an increase in his top rate on long-term capital gains and qualified dividends from 15% to 20%. Also, because Obama allowed the expiration of the temporary 2% reduction in the payroll tax rate on the first $113,700 of self-employment income. Wait, there is more. Thanks to Obamacare, Mickelson will be liable for an additional 0.9% tax on his self-employment income and 3.8% tax on his net investment income after each exceeds $250,000. However, it does not stop there, the folks of California actually passed a proposition to increase taxes. In November, California passed Proposition 30, which increases the top income tax rate on resident millionaires to 13.3%. Q. When you’re asked about Stricker’s semi-retirement, with the political situation the last couple months, blah, blah, blah, what did you mean by that? Do you find it an unsettling time in a way? PHIL MICKELSON: Well, it’s been an interesting offseason. And I’m going to have to make some drastic changes. I’m not going to jump the gun and do it right away, but I will be making some drastic changes. Why wouldn’t one question working hard, entering as many tournaments as Phil does and being away from his family when between the feds and state they take more than 60% of his income. All this so Obama and the libs in California can redistribute his hard work to slackers. Makes all the sense in the world, those that work their tail off, to have the fruits of their labor given to those who don’t. Welcome to Obamaland. Fity years aqo there were studies of the effects of tax levels on the economy. These studies compared most of the western nations. The conclusion at that time was if the government took 40 percent of the money out the economy, things in the business world began to shrink. This tax was inclusive of local, state and federal taxation. The progressives/socialists have never believed this to be true and they have pressed their agenda of the tax and spend relentlessly forward. We would have been at this point thirty years ago if Ronald Reagan had not managed to get the high federal tax rates down to a reasonable level. The “Great Society” plan of the progressives from JFK and LBJ is the root cause of our societies troubles. They managed to destroy the family, perpsonal integrity and responsibility and the economy all in a package. The political parties are responsible for our present condition. The people need to get back to the concept that our founders used to make the country great. Everone has to pull their own weight and the constitution has no provision to take money from those who work and give it to those who do not. I’d take the life of an over the hill millionare golfer over some working for minimum wage slave job that millions of working Americans looked forward to this morning. What’s worse, paying these “entertainers” so well they can BUY SMALL COUNTRIES or having to listen to them whine about taxes …. SM: Sorry, but one’s salary is comparable to their skills and the amount of time they take to perform their craft. A millionaire golfer already pays more money in taxes than a minimum wage worker. So sorry you are so bitter and envious of others who make some thing of themselves. Its hardly an endearing quality. But I bet you support football and/or basketball.